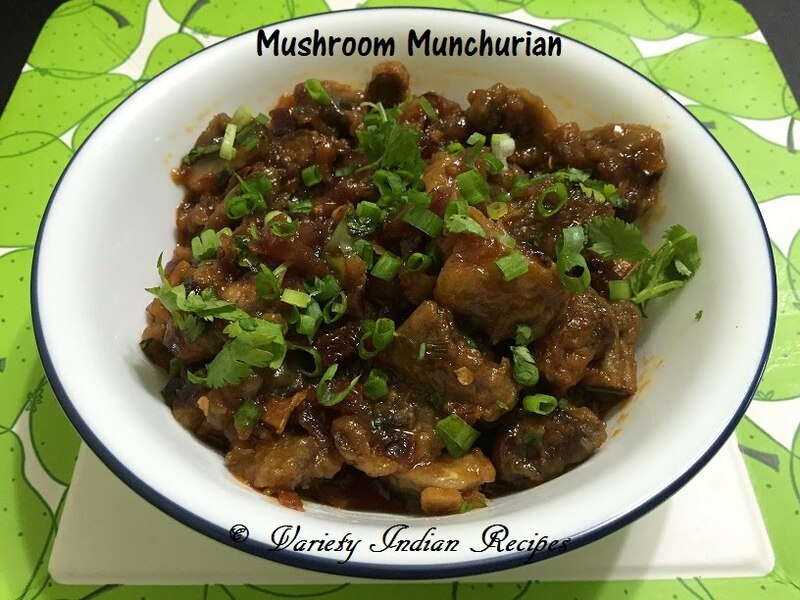 Mushroom Munchurian dish posted here is a Indo Chinese recipe. Mushroom munchurian is a popular starter and also tastes good when served with fried rice. Mix corn flour and all purpose flour with a little water to form a smooth paste. Add little salt to taste and mix well. Dip mushroom in the paste and deep fry them in oil until crispy and golden brown. In a pan heat a table spoon of oil. Add chopped ginger and garlic. When ginger garlic sizzles, add onions, salt and saute. Once the onions turns transparent add green chilly, 2 table spoon of spring onions and saute for a minute. Add chilli powder and saute. Now add soya sauce and saute. Add tomato sauce, sugar and mix well. Add chopped coriander leaves, mushrooms and toss until the sauce gets well coated. Sprinkle spring onions, turn off flame and serve hot.